"Productivity and Potential Output Before, During, and After the Great Recession" a new paper by John Fernald (NBER Working Paper No. 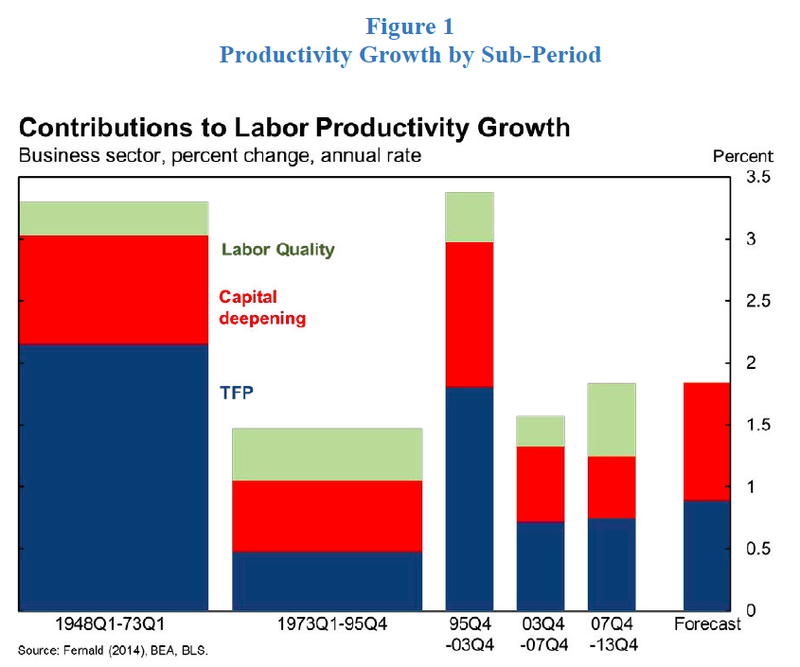 20248, June 2014) looks at the U.S. labor and total-factor productivity growth slowdown prior to the Great Recession in the context of the slowdown "located in industries that produce information technology (IT) or that use IT intensively, consistent with a return to normal productivity growth after nearly a decade of exceptional IT-fueled gains". In a sense, the paper reinforces the point of view that I postulated in my TEDx talk last year dealing with the 'end' of the Age of Tech (here: http://trueeconomics.blogspot.ie/2013/11/14112013-human-capital-age-of-change.html). 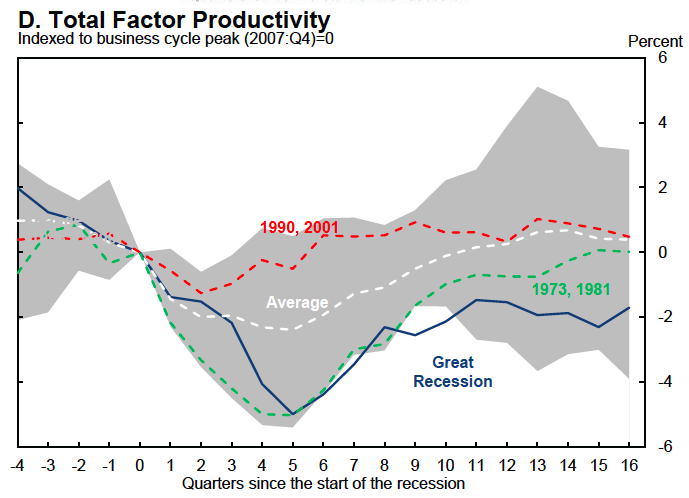 Fernald argues that "The past two decades have seen the rise and fall of exceptional U.S. productivity growth. 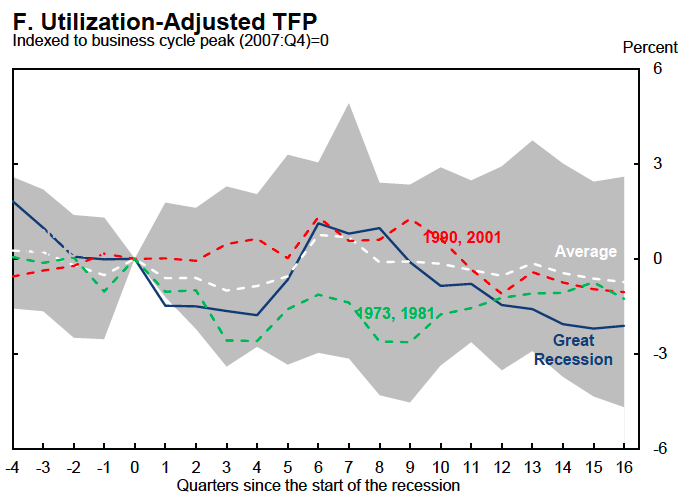 This paper argues that labor and total-factor-productivity (TFP) growth slowed prior to the Great Recession. It marked a retreat from the exceptional, but temporary, information-technology (IT)-fueled pace from the mid-1990s to the early 2000s. This retreat implies slower output growth going forward as well as a narrower output gap than recently estimated by the Congressional Budget Office (CBO, 2014a)." 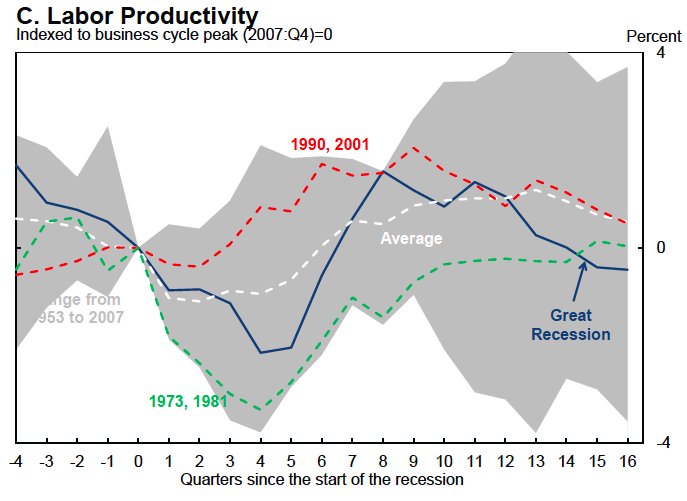 Figure 1 from the paper illustrates how the mid-1990s surge in productivity growth indeed ended prior to the Great Recession. 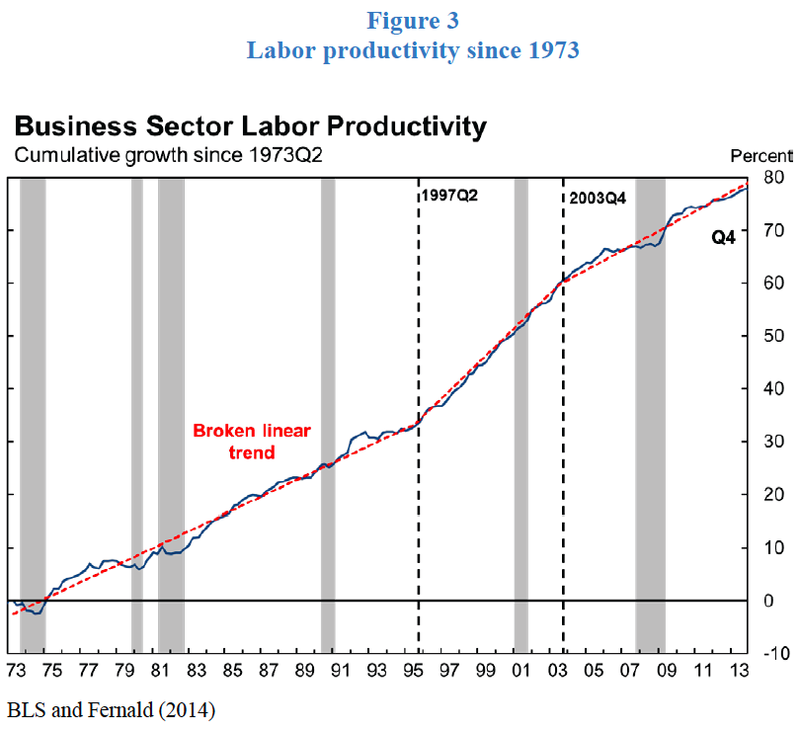 The rise in labor-productivity growth, shown by the height of the bars, came after several decades of slower growth. 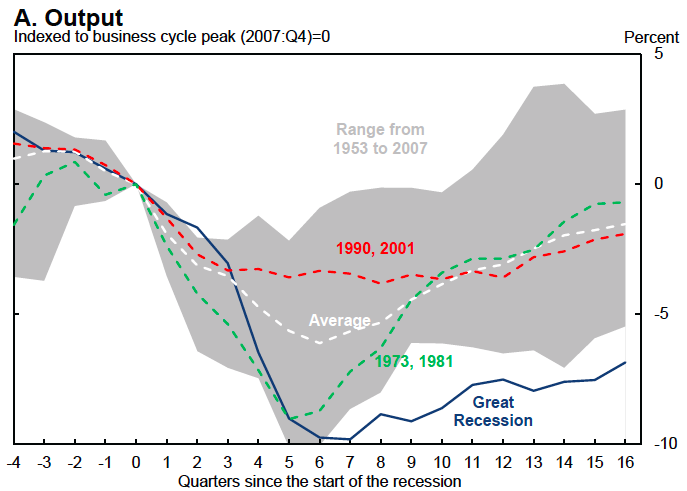 But, notes Fernald, "in the decade ending in 2013:Q4, growth has returned close to its 1973-95 pace. The figure shows that the slower pace of growth in both labor productivity and TFP was similar in the four years prior to the onset of the Great Recession as in the six years since." means are removed from all growth rates prior to cumulating, using a biweight kernel with bandwidth of 48 quarters. Source is Fernald (2014). All of the above show the cyclical disaster that is the current Great Recession, but crucially, they show poor recent performance in Labour Productivity, exceptionally poor performance in Hours of Labour used, disastrous performance in Total Factor Productivity… in other words - historically problematic trends relating to productivity, labour utilisation and tech-related productivity in the current recession compared to all previous recessions. But more worrying is that, as Fernald notes: "That the slowdown predated the Great Recession rules out causal stories from the recession itself. …The evidence here complements Kahn and Rich’s (2013) finding in a regime-switching model that, by early 2005—i.e., well before the Great Recession—the probability reached nearly unity that the economy was in a low-growth regime." So what's behind all of this slowing productivity growth? 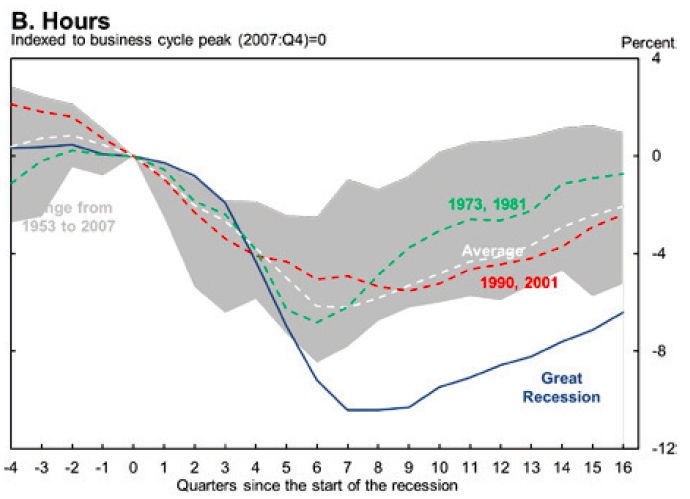 "A natural hypothesis is that the slowdown was the flip side of the mid-1990s speedup. Considerable evidence… links the TFP speedup to the exceptional contribution of IT—computers, communications equipment, software, and the Internet. IT has had a broad-based and pervasive effect through its role as a general purpose technology (GPT) that fosters complementary innovations, such as business reorganization. Industry TFP data provide evidence in favor of the IT hypothesis versus alternatives. Notably, the euphoric, “bubble” sectors of housing, finance, and natural resources do not explain the slowdown. Rather, the slowdown is in the remaining ¾ of the economy, and is concentrated in industries that produce IT or that use IT intensively. IT users saw a sizeable bulge in TFP growth in the early 2000s, even as IT spending itself slowed. That pattern is consistent with the view that benefiting from IT takes substantial intangible organizational investments that, with a lag, raise measured productivity. By the mid-2000s, the low-hanging fruit of IT had been plucked." The Age of Tech is now in the part of the cycle where returns to innovation and technology are falling, while returns to financial assets overlaying tech sector are still going strong. The classic bubble scenario is being formed once again, as always on foot of disconnection between the real economic returns to the assets and asset valuations. This bubble will have to deflate.